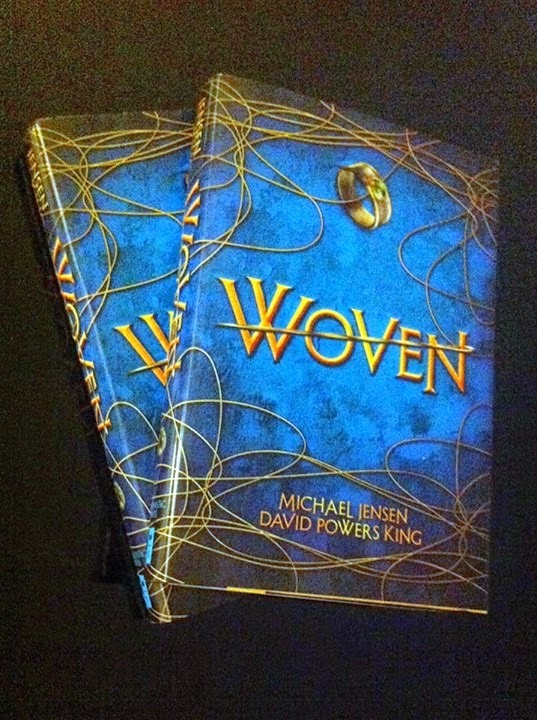 David Powers King: Wishing You A Happy New Year With A Special Sneak Peek Of The WOVEN Hardbacks ... See You In 2015! Wishing You A Happy New Year With A Special Sneak Peek Of The WOVEN Hardbacks ... See You In 2015! The end of 2014 is here. What a wild and rambunctious year it was. Now I'm gearing up for the excitement of a lifetime because WOVEN will be available to the world in less than a month! Christmas came early from our publisher--they sent us fresh copies from the first hardback printing, and they are gorgeous. Here's a special preview! I can't begin to tell you what an amazing job the Scholastic team did on this book. The cover really pops when you hold it in your hand. The title, the ring, and even the threads are raised slightly. And the hardcover itself is a golden yellow with blue on the inside. There is even a special surprise pressed into the hard back. You have to take the jacket off to see it, and I dare not spoil it. I am more excited than ever for everyone to see this. Every page is truly a work of art. I absolutely LOVE that tagline! We're gearing up for events, a launch party, and a three-week blog tour. All of our slots are already taken (some double-booked), but by all means, we would love your help spreading the word. If you want to weave this thread throughout the Internet on January 27, please email me HERE. We will send you an information packet. I end this post with a host of gratitude for all who have made this blog a part of their lives and for all who have believed in me and this book through thick and thin. Thank you forever, my dear friends. I'm David, and WOVEN is available for preorder at these locations! That's a great-looking cover! Wishing you all kinds of success... and a Happy New Year. All set to help you and I am on page 106! Happy New Year, my friend. This will be YOUR year. Isn't it such a rush to hold your book in your hands? So exciting. And I'm so happy for you and Michael. It's a lovely book--both the outside and the inside. Happy New Year, my friend. Wow. This is excellent news. I love that cover. It is spectacular! The cover does look awesome (the blue and gold really works!). Now I'm going to be wondering what the special surprise is. Congrats! A wonderfully crafted cover. Really. Wishing you much success. Squeee! What a great way to end the year! Happy new year and Congrats! The book is gorgeous, and yes -- I love that tagline! Congratulations! There is nothing like holding your own book in your hands for the first time. Each of your books, I should say, since I'm sure there will be plenty more in your future! 2015 baby!!! Can't wait to see your success be bonkers! WOOHOO!! Looking great! I can't wait to see these on the shelf. Are you and Michael planning any book signings? Looks awesome:) I will indeed need to read some Woven for my New Years resolution! So excited for Woven!!!! Reading and LOVING it… and the cover is GORGEOUS… just gorgeous… DPK, you're such a light. And I'm so excited for all your success and future successes. You've got big things coming and I can't wait to watch you live through it all. The release date can't come soon enough!!! Thank you for sharing with us as well David. All the best and can't wait to hold my own copy of Woven. I love the cover and we are all a tread in the circle of life. This one will be a must read for me. sorry should be thread..finger slip. Wishing you success. I'm so glad to be sharing this adventure with you! I'm so happy for you. Here's to 2015! Dang! That cover is gorgeous! Can't wait to see it on my bookshelf. Happy New Year!